Available in a variety of materials. Fade resistant. Used by all major shipping & transport companies. 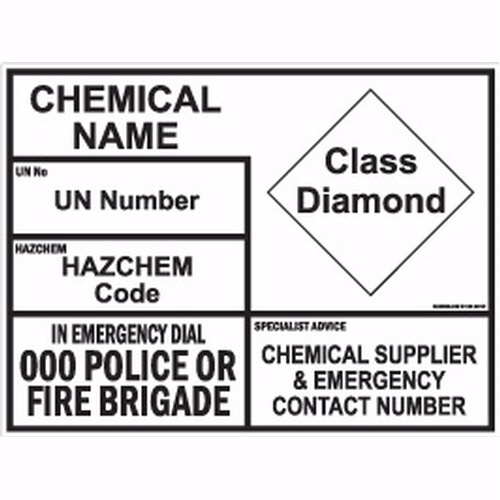 Can be printed with full details including CHEMICAL/PRODUCT NAME, HAZCHEM CODE, UN NUMBER, CLASS DIAMOND, SPECIALIST ADVICE DETAILS. 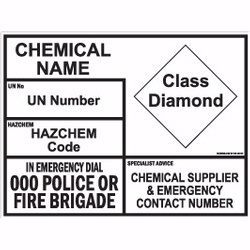 Used for placarding shipping containers, truckloads of dangerous goods, warehouse storage of BULK Dangerous Goods, Iso-Tainers, IBCs, Kellypack, and Bulk Gas Cylinders. FAST TURNAROUND. LOWEST PRICE OR IT'S FREE!! !